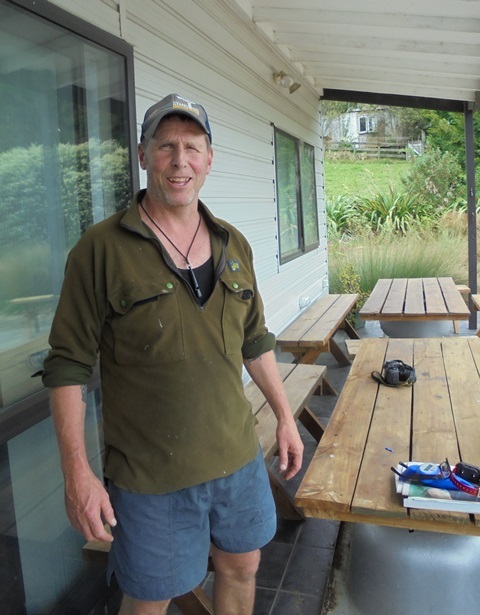 Since 2013 there have been kiwi in the area thanks to the efforts of our neighbours, Gill & Kevin Adshead at Mataia. 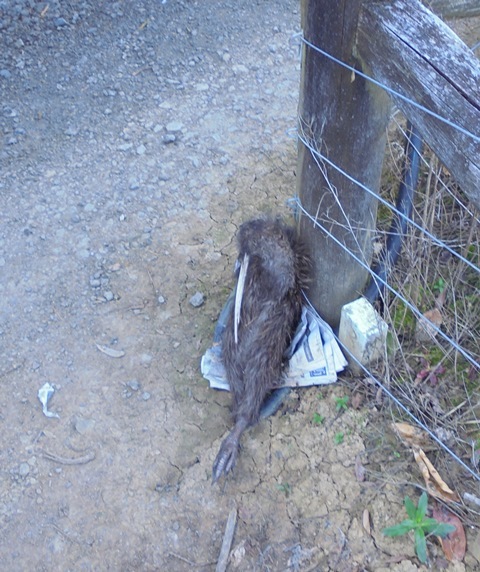 Kiwi are New Zealand’s national bird and being flightless, are seriously endangered by introduced predators. 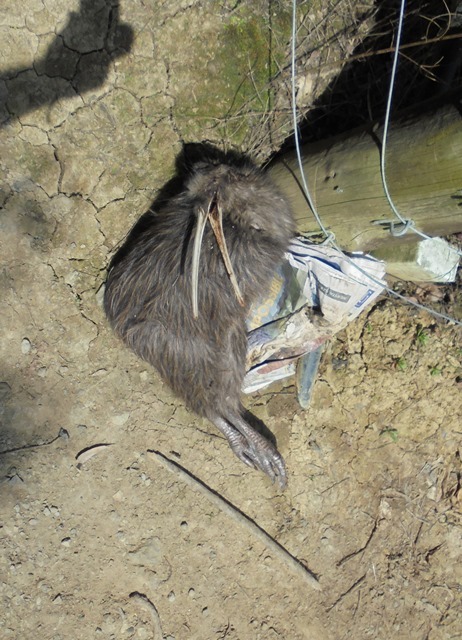 Farm dogs and hunting dogs may encounter kiwi in the wild and need to be trained to avoid them. 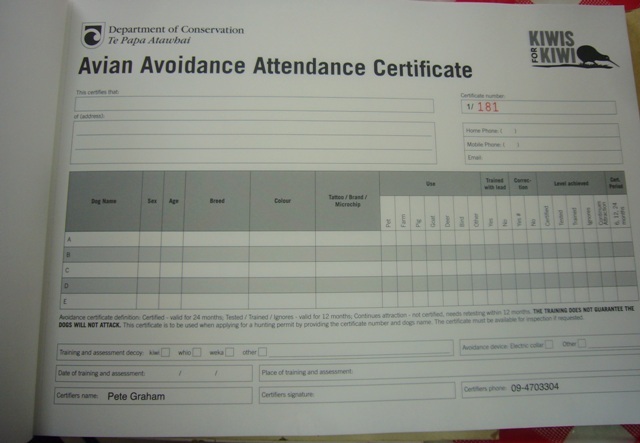 Aversion training involves making dogs want to avoid any kiwi that they encounter, but the training needs to be refreshed every couple of years to make sure the dogs still will avoid kiwi. 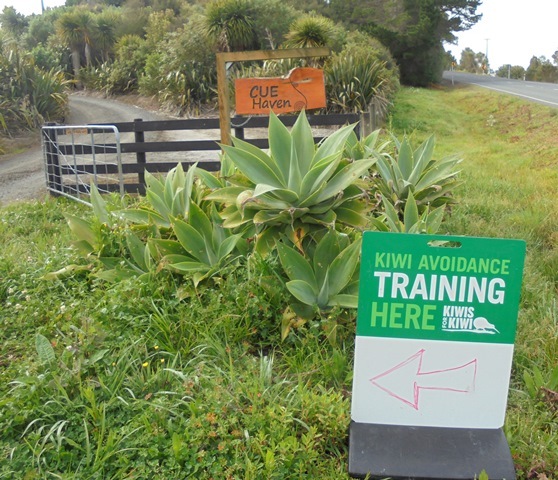 Since 2014 CUE Haven has been hosting Kiwi Aversion training for local dogs. Today’s program was sponsored by Kiwi for Kiwis and run by Pete Graham of the Northland Regional Council. 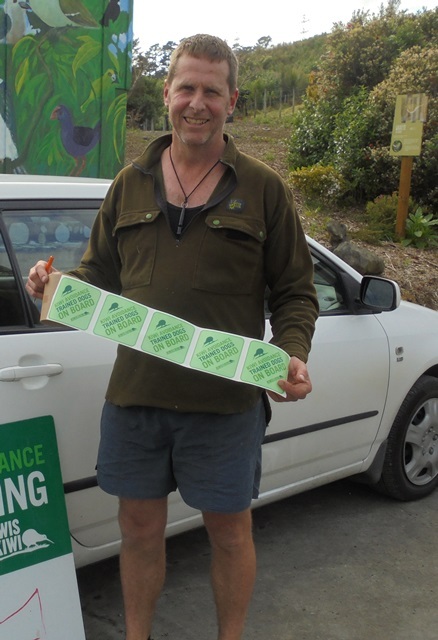 Here is Pete showing the stickers each dog owner receives to put on their vehicle, as some hunting and hiking reserves will not permit dogs that haven’t been through aversion training. 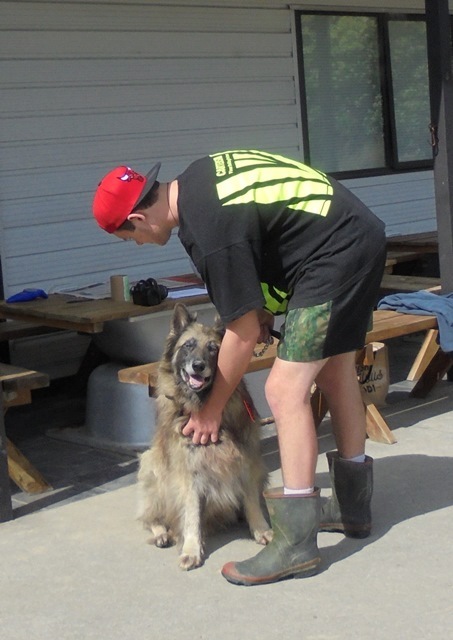 The training works by exposing the dogs to the scent and sight of a kiwi and giving them a mild but unpleasant electric shock at the same time. The dog associates the sensation with the scent and will avoid kiwi in the future. 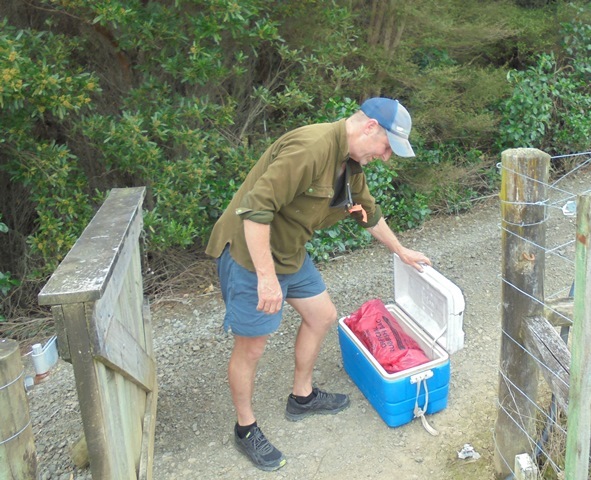 As in previous years, Pete brought out two dead, frozen kiwi and set up a run through which the dogs would have to pass and encounter the birds. 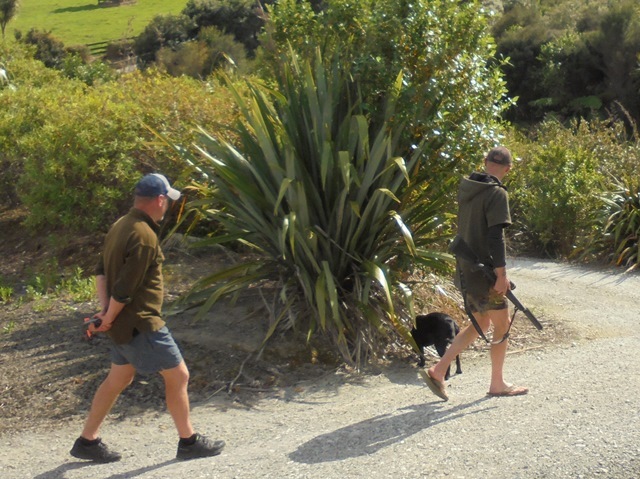 A kiwi was placed at each end of the run and the idea is that the dog will encounter the first kiwi, get a shock if it shows interest and then, if the training has been effective, it will avoid the second bird. Today 21 dogs went through the training. The variety of dog breeds included –Visla, Visla cross, Spoodle, Hunterway, Staffordshire cross, Belgium German shepherd, Labrador, Jack Russell, Fox terrier and Border collie. 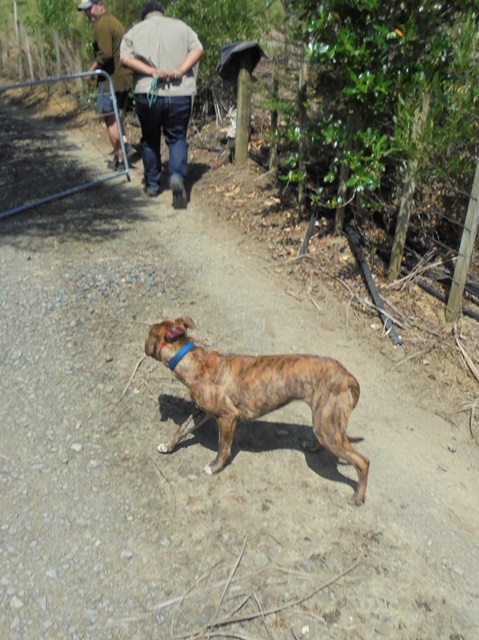 Except for a few new dogs, all of them had been exposed to the kiwi aversion training in prior years so today for most of the dogs it was more a test to ensure the training was still working. 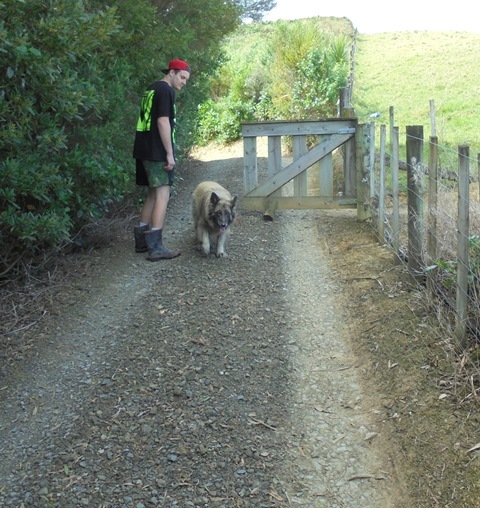 The effectiveness of the training was demonstrated as most of the dogs just walked through the run and ignored the kiwi or refused to approach the run at all for fear of the zap they still remembered. And when it saw the second one, it didn’t want to get close, turning around to head back the other way. But not all dogs were so lucky. This new dog went up to the first bird and got a zap. And didn’t want to go back into the run. One hunter wanted his dog to feel as if they were actually out on a hunt and asked if he could bring along his rifle to make the dog think they were hunting. As each dog finished the training, Pete presented the owner with a certificate which can be used as evidence of successful training. As usual, it was a fun day and a great opportunity to catch up with old friends and meet new ones. And it’s always a pleasure to meet up with the great dogs whose behaviour is a positive reflection on the efforts the owners have made to train them. Gill and Kevin – our many thanks for taking the initiative and arranging for the training today. Your passion for conservation is a real inspiration to us. And a very big thank you to Pete Graham for giving up a Sunday and coming out to conduct the training. 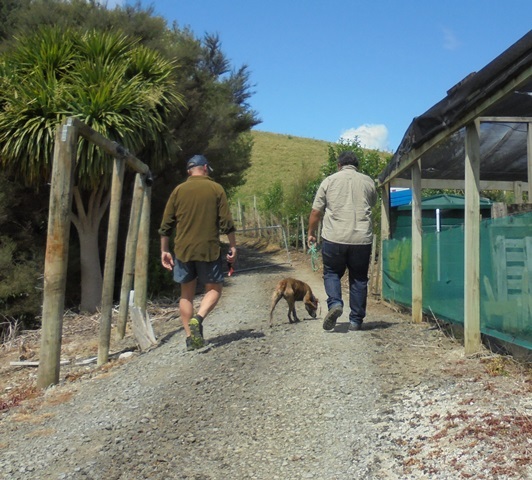 Pete, we really enjoy watching you interact with the dogs and their owners and we also appreciate you sharing with us some of your wealth of knowledge about kiwis and New Zealand native plants and animals and how to protect them. Thanks again everyone for your participation – we looking forward to seeing you all again soon. 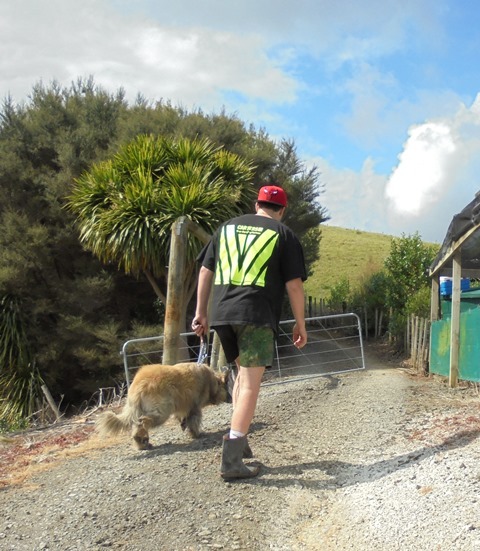 And we look forward to the day when kiwi will be roaming freely at CUE Haven too!